POMEROY, Ohio — A perfect 10. The Meigs golf team picked up its 10th straight Tri-Valley Conference Ohio Division victory on Wednesday night following a 13-stroke victory over the field during the season’s third league match at Meigs County Golf Course. The host Marauders improved to 18-0 in TVC Ohio play this fall after posting a winning tally of 171, which ended up being well ahead of runner-up Athens and its final tally of 184. Vinton County was third overall with a 190, with Alexander (197), Wellston (216) and River Valley (218) rounding out the four through six spots. Nelsonville-York did not have enough participants to record a team score, which led to a seventh place finish in the standings. MHS senior Levi Chapman continued his individual dominance of the league after winning medalist honors for a third consecutive time after posting a 1-over par round of 35 over nine holes. Whit Byrd of Alexander was the overall runner-up with a 38. The Marauders — who won all seven TVC Ohio matches last fall — opened up a four-win lead in the overall standings following their latest triumph. The Bulldogs are now in sole possession of second place with a 14-4 mark in TVC Ohio play this fall, while the Vikings (13-5), Spartans (9-9) and Golden Rockets (6-12) currently round out the top five seasonal spots. The Raiders are all alone in sixth place with a 3-15 league mark, while the Buckeyes are still winless at 0-18 overall. Wyatt Nicholson followed Chapman for MHS with a 44, while Bryce Swartzel and Brayden Ervin respectively rounded out the winning tally with efforts of 45 and 47. Bobby Musser and Cole Arnott also had respective marks of 48 and 50 for victors. Aaron Burke led RVHS with a 45, followed by Gabe Gilmore with a 54 and Elayna Canizares with a 55. Chloe Gee completed the Raider total with a 64, while Hayley Cox and Tyler Roberts respectively added rounds of 69 and 71. Drew Zorn paced Athens with 43 and Preston Hayes added a 44, while Ryan Sheehan and Owen Campitelli completed the AHS tally with respective rounds of 48 and 49. Sam Carpenter and Ben Pratt each fired a 49 as well for the Green and Gold. Shawn McCarty paced the Vikings with a 44 and Noah Waddell added a 47, while Cameron Hamon and Bailey Bartoe completed the team tally with respective efforts of 49 and 50. Adam Clary and Owen Salyers also added identical rounds of 60 for VCHS. Andrew Vogt followed Byrd with a 51, while Matt Morris and Jake Conrath completed the Alexander scoring with matching rounds of 54. T.J. Vogt and Tanner McDowell also had respective efforts of 56 and 65 for the Red and Black. Hunter Cardwell paced WHS with a 48 and Brandyn Bush followed with a 52, while Timothy Stanley and Jacob Sheaffer completed the Rocket tally with respective efforts of 56 and 60. Brice Sizemore also shot a 63 for the Blue and Gold. Clay Hall led NYHS with a 63 and Caitlyn Hall added a 68 for the Orange and Brown. 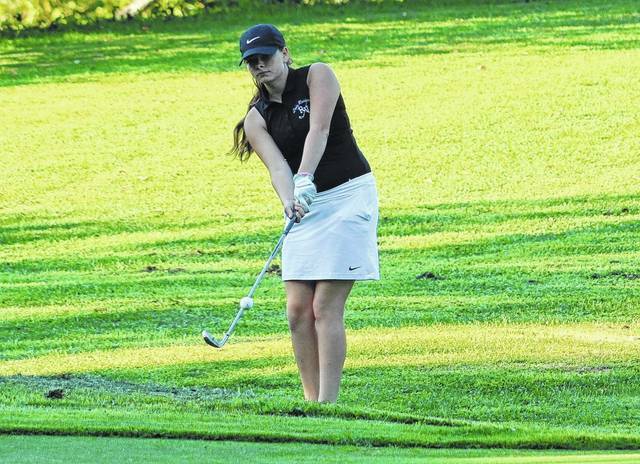 The Buckeyes will host the fourth TVC Ohio match of the year on Wednesday at 4:30 p.m.
River Valley junior Chloe Gee hits a chip shot on the ninth hole during the third TVC Ohio golf match of the season on Wednesday night at Meigs County Golf Course in Pomeroy, Ohio.